I haven’t taken the time to write much lately and my blog has become completely dedicated to race recaps. I want to try to be better about writing things down when they come to me and/or reflecting on my running, but for now the Redhook Crit 5k marked the beginning of the spring season. Crit is short for Criterium. It’s a type of bike race held on a short course, usually less than a mile (in this case, 1300M), on blocked off city streets. The race is run in laps and there are often prizes throughout the races for lap times and/or leading certain laps. It was at the Brooklyn Cruise Terminal, overlooking the East River and the Statue of Liberty. The plan for the event was to have the qualifying rounds for the Crit first, then the 5ks, then the finals of the Crit. So on a gorgeous day, cycling fans would be able to enjoy the view and stick around to watch the 5k, even if it was just while they waited for the Crit finals. Saturday was far from gorgeous. It was the kind of day that makes me want to stay in my pajamas and read books with hot chocolate while I watch the rain pour down. Early in the day the decision was made to push the 5k back after the Crit final because the rain was supposed to get worse the later it got and that was more dangerous for the bikes. It was dangerous regardless of the schedule change because the 5ks got pushed back farther after a crash in the women’s final. All things considered, I was impressed with the number of spectators who stuck around anyway. Nat was a really good sport and stayed with me the whole time getting drenched to cheer and and hold my sweats. We finally got to the line, soaking wet and ready to run. Once we got going and I got more used to the dark road with huge puddles, it was actually a really fun race. There was bonus money in leading the first lap, but I had my mind on the overall results so I sat back a little while keeping the leaders in sight. Then on the second lap I focused on slowly reeling them in. For the second half of the race I was in a small group of three, working but feeling comfortable enough. The laps made it interesting because at one end of the loop was a tight turn around. 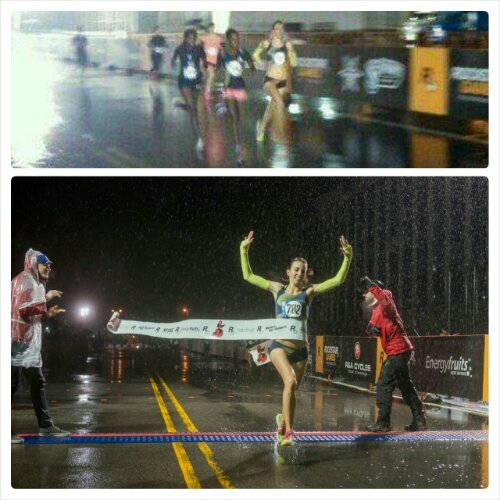 At the same time, I got to hear Nat and a Oiselle fan who braved the weather (thank you!) every time I came around. I was in front going into the last lap and I wasn’t sure if the two women near me were drafting or getting tired. By the second half of that last lap I was ready to move. I felt great finishing and it was the first time I’ve ever gotten to run through the ribbon! I did my cool down and put on dry clothes as quickly as I possibly could, but my muscles can tell that I had been wet and shivering a bit. Nevertheless, time to get back at it because spring is here! I’ve updated my tentative race schedule and I’m looking forward to a great outdoor season.